A couple of days ago, I was thumbing through the April issue of Parents Magazine and came across an article titled “Super-Healthy, Super-Easy Snacks.” The article explains that since kids have tiny tummies, they fill up easily at meal times and actually need snacks in-between to keep their energy up. Chips? Did they mention chips? Of course they did – because tortilla chips are one of those “super-healthy” snacks … and “super-easy” too: just lightly coat two whole-grain tortillas with vegetable-oil spray (yee-uck! ), bake them for 10 minutes, cut them into wedges, and use them to scoop up some pineapple chunks. The entire snack is only 112 calories and – best of all – only 2 grams of fat! Yes, of course I do. I’m like any other dedicated father — if I’m already sitting down in the bathroom, I’ll read whatever is within arm’s reach. I’m reasonably sure my wife arranges the magazines with exactly this purpose in mind. When my girls were toddlers, I could offer informed opinions about the hottest must-have toys in the Fisher-Price catalog (which I affectionately referred to as the “For Sure Overpriced catalog). I know the editors mean well, but this article is just another load of the same old bologna: Carbohydrates are wonderful, and fat is bad. If you want to be a good mommy, you must be vigilant in protecting your progeny from the evils of dietary fat. Biscotti Gone Bananas: basically, a banana-bread mix shaped into biscotti and baked. Just 101 calories and 3 grams of fat. Breadstick Snails: breadstick mix, curled up to look like a snail, mixed with pesto sauce. Just 96 calories and 3 grams of fat. Peach Crisp: canned peaches in light syrup (uh, that would be sugar), topped with cinnamon, low-fat granola, and low-fat yogurt. Just 101 calories and 1 gram of fat. Only 1 gram of fat? Well, that’s a relief; it makes the math easy. The 1 gram of fat provides 9 calories. We’re looking at perhaps 2 or 3 grams of protein, at 4 calories per gram. Split the difference, and you get 10 calories. That means this “super-healthy” 101-calorie snack provides 82 calories from carbohydrates. 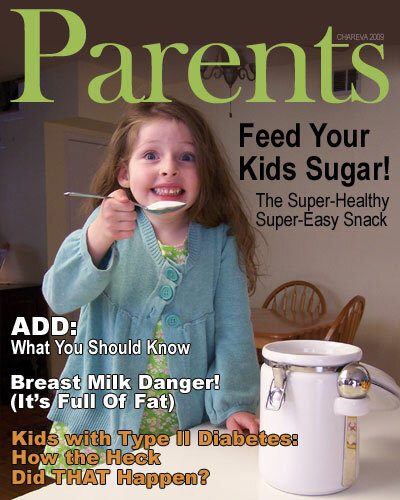 Congratulations … thanks to the nutrition experts at Parents magazine, you just served Little Johnny the equivalent of nearly two tablespoons of sugar – more than six times the amount of sugar in his bloodstream. To avoid going into sugar-shock, Little Johnny’s pancreas will have to crank out some insulin to smack his blood sugar down. It’s 3:30 in the afternoon, and dinner is still nearly two hours away. Little Johnny’s tummy is rumbly, but you’re already swamped with making dinner and helping Johnny’s big sister Sally with her homework. So what’s a busy mom to do? Here’s a simple but effective trick: go to the sugar bowl, and scoop two tablespoons of those delicious white granules into a plastic serving cup. Then hand the cup to Johnny, along with his favorite Spider-Man spoon, and voila! – Johnny is happy, and so are you, because you can return your attention to Sally’s homework. But I’m pretty sure the editors would reject my article. I might even find some helpful people from Child and Family Services standing on my porch the next time the doorbell rings. They’d order me to take a state-approved parenting class, where I’d learn that sugar is only a “super-healthy snack” if it’s dressed up as a breadstick. To be fair, the authors did suggest a few higher-fat snacks, such fruit-and-cheese kabobs, or fruit dipped in dark chocolate. But most of the “super-easy snacks” are based on bread, crackers, waffles, or granola … otherwise known as starch, starch, and more starch, with a little sugar thrown in. The irony here is that the same issue features advertisements for ADD drugs, plus an article on how to deal with temper-tantrums. Well, that’s just great: in one article, you can learn how to prepare Little Johnny a snack that will take his blood sugar on a roller-coaster ride. Then, while Johnny is busy bouncing off the walls, you can flip to another article and prepare yourself for the meltdown. If you’re a fast reader, you might even finish the article before Johnny’s blood sugar crashes. Then you can confidently attempt to use psychology to handle a problem that is almost purely biochemical. The result of the anti-fat campaign has been skyrocketing rates of juvenile diabetes and attention-deficit disorders, not to mention a lot more kids wearing what we used to call “huskies.” Naturally, after witnessing the sorry outcome of their efforts, the experts reached the obvious conclusion: we should continue doing exactly what they’ve been telling us to do, only more of it. I am, of course, accustomed to seeing dietary bologna promoted in the popular media. But it was a bit jarring to realize I actually give subscription dollars to a magazine that’s helping to spread the anti-fat hysteria and advising parents to feed their kids sugar and starch. Great stuff. You should send it to them! I might do that. Although I’m pretty sure I could give up on ever selling them a real article afterwards. Oh how true!! I work in the kitchen of an elementary school. We serve sugar in many forms!! I am even told to add sugar to the pineapple packed in its own juice! They say it is just too sour without it. Wow I wish I had known that when I was raising my kids. Poor things had to eat sour pineapple!! lol Keep up the great work. From what I’ve been told, schools have to conform their meals to the USDA pyramid. That alone means we’ve got trouble. I’m really unsure where cocoa puffs became “healthy”. When I was growing up, I remember wanting cocoa puffs, though I never got them because they were (in my parents’ words) sugary expensive crap. I was valedictorian and not fat, so how the heck did that happen? They didn’t want us having sugar and whitebread and all that because children go hyperactive and destructive for about 2 hours then crash and become irritable. This was not due to any “parenting advice”, more due to the simple observation that sugar = nutso kids, no sugar = pleasant kids. They also get really irritated with health labelling on suspect items such as that. They eat plenty of fat as meat, milk, eggs, avocadoes, olive oil etc. They are in their 50s and are incredibly healthy (like, marathon running healthy). How the heck did that happen? I was at a party last night and talked to some friends I told about Fat Head a couple of weeks ago (postraduate science students). They went low carb and in two weeks they say they are feeling loads better. They also say their food is now more interesting because not everything is “serve with pasta, rice or mashed potatoes”. 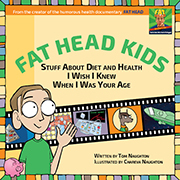 They had both learned (as had I) about carbohydrate and fat metabolism, as well as insulin in their undergraduate university course, so knew that fat wasn’t bad in itself, but it took until we told them about Fat Head for them to realise that their culinary habits were based on bad science. Not because they were thinking about the nutritional contents wrong, but simply because that is how they learned to cook, so continued. I appreciate the ongoing P.R. for the film! The Parents article especially annoyed me because when I became a fat kid — at around age 13 — I was eating cereal and toast for breakfast, starchy meals at school for lunch, dry cereal in a cup for an afternoon snack, and dinners that always featured corn or rice or potatoes on the side. Hey Tom, great post! I find I can hardly read any of the “mainstream” magazines any more.. my eyes start to hurt from rolling so much. I think that’s why my wife was so happy I started blogging; I put my “just saw another idiotic article” tirades into print now. Good stuff. I used to work as a Dietitian at the WIC program, and we stuffed this kind of information down people’s throats all day. I think I’ll be repenting for at least the next ten years! The funny thing is, looking back I can remember many moms complaining that they feed their kids all the good low fat foods but little Johnny was still overweight (young kids are naturally fatter, but this was obviously an excessive amount of fat – but very common in the lower socioeconomic class that we served). I assumed they were telling lies or didn’t know what foods actually had fat in them. And we provided free copies of this magazine! I also have some repenting to do. When I wrote for a health magazine 25 years ago, we pushed the same low-fat advice. My wife has friends who complain that they try to give their kids low-fat foods, but darnit, Little Johnny keeps begging for bacon and eggs. She’s lent out a few copies of Fat Head. At least one mom was converted — she had her daughter on soy milk, of all thngs, to try to keep her weight down — but a couple of others just returned their copies after watching with no comment … and still feed their kids low-fat starch. I guess they decided I was just nuts. There’s “breast milk danger – it’s full of fat” article from this magazine to be covered yet. O tempora, o mores! The problem with using exaggeration for humor is that reality keeps catching up to the exaggeration. We may see that article eventually. I’m with Ellen, send it to them and maybe, just maybe someone will stop and think. Just hope I don’t get a letter-bomb when our next issue arrives. I have to laugh at TonyNZ’s comment about his Mom not wanting them to eat too much sugar and white bread. One of my snacks as a kid was a mushy piece of white bread smothered in a layer of sugar. Oh yeah, now that might explain why we all grew up with variations of heart disease, obesity, and diabetes. I also remember that even pre-sweetened cereal, like Fruit Loops, required additional sugar on top. Jiminy, no wonder I ended up stealing change and making trips to the convenience store to feed my sugar addiction. I bought healthy snacks like Twinkies, candy bars, pixie stix, and would balance it out with something salty like potato chips. May I also mention that I had problems in school? I grew up on Sugar Smacks, Sugar Pops and Sugar Frosted Flakes — all of which have now been renamed, but have just as much sugar. We also ate cinnamon toast with sugar spread on top. I shudder to think. But at least we drank whole milk and didn’t worry about cutting the fat from our meals. Now kids don’t even get real fats in the diet to slow down the sugar spike. You continue to write informative and laugh-out-loud articles. Thanks Tom! Thanks, Mark. I saw your post about Danny Ainge … let’s hope his doctors don’t kill him. I think we can safely dismiss the “fat, lazy slob” theory as to why he developed heart disease. Tom, these are the blogs i visit daily: yours (Fathead), mark’s Daily Apple, Dr. Mike’s, and Jimmy Moore’s. Your posts are informative, encouraging, and fun! I’m passing this post on to my sister, who is new to low-carb and has two kids to make snacks for. We read the same blogs. My girls like cheeses (fresh as we can get them), olives, and nuts for snacks, with a little fruit now and then. They’re energetic and happy. And since my five-year-old was the only kid in her class to get a perfect score on their first addition/subtraction test, I don’t think a lack of starch is hurting her brain any. Looking at this another way they’ve put this wonderful WARNING label on the box for us. Indeed … that’s how I view any food with the AHA logo. I was a young nutritionally uneducated mother and fed my son low-fat foods for about a year and a half after I weaned him (he was 1.5 years old). When I was tired of him being sick all the time, I started learning more about nutrition and natural health. It might just be his disposition (or my style of discipline), but I don’t deal with temper tantrums and any other unsavory behavior I see from other kids. He’s as skinny as a rail at 6 years old and eats as much as an adult at some meals. But his doctor said whatever I was doing (and he told me he didn’t want to know) was working because now he’s in the 75th percentile for height and weight too instead of the 50th. He’s almost never sick! I’ve pretty much given up on mainstream magazines for nutrition suggestions. At least now I know I’m not the only one that reads the articles and gets upset. BTW- My son loved your movie. Esp. the part that explains why people get fat (“who’s hitting me?”)… He was cracking up and keeps walking around singing “fat head. fat head!” 😀 We watched it as a family (my parents, my boyfriend and my son.) I figure if I teach him now, he won’t have problems like I did with nutrition when he’s a teen. Sounds like your son will have a healthy childhood. He also has excellent taste in comedy. 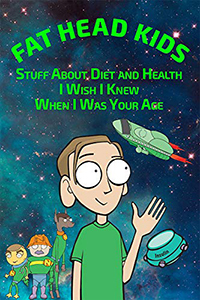 Knowing what I know now, I would never put a kid (or an adult) on a low-fat diet. My daughter negotiates for extra bits of fat from my steak, and she usually gets it. She also sang the “Fat Head” song for days on end after hearing it. That’s her on the mock magazine cover. We got a new doctor. Wow. And what’s really scary is that many patients would assume that if a doctor says it, it must be good advice. Glad you knew better. Marie M. Good to hear you don’t instantly assume a doctor is correct. I went to a doctor once when I had the flu. I knew I had the flu, I just needed a medical certificate for study purposes. She said to me “Well, you probably have the flu. I’ll give you some antibiotics anyway ’cause they might help”. I basically snorted at the doctor and said “you’re kidding, right?”. She dismissed me, but gave me the medical certificate anyway, so I could get notes for the lectures I had missed, ironically talking about the evils of antibiotic resistance. I never picked up my antibiotic prescription. One result of researching this film is that I’m less likely to listen to doctors. I suppose I’ll end up with a black mark in my record soon. A year ago, I had a doctor tell me I needed to go on a lowfat diet because my cholesterol was elevated. When I asked him to put a number to that claim, the answer was 203. I asked for my HDL figure. It was 61. I asked for my triglycerides. They were 62. I told him he just informed me that I have an excellent lipid profile for a 50-year-old man, and my diet was obviously fine. I get especially angry when “experts” start advising that children eat a low-fat diet. They ought to be convicted of child abuse. And did you know that temper tantrums, screaming at parents, refusing to obey parents, shouting profanities at parents, etc. is now called “Oppositional Defiance Disorder” and is treated by having parents take parenting skills classes to learn from “experts” how to defuse their child’s ODD, and if their skills don’t improve enough to help their child, then they can try drugs developed for schizophrenia or OCD on their kids? Good grief … my wife and I call those behaviors “Kids Testing Their Boundaries,” and we treat them without benefit of modern pharmaceuticals. Apparently if you attach a frightening, multi-syllabic label to any condition, you can sell a drug to treat it. great post! what a beauty – and a comedian – your daughter is! i just put ‘olives, cheese, nuts,’ on the shopping list. i look forward to more posts on specific foods and other lifestyle choices for grownups and kids! I know exactly what you mean about not wanting it to be over. I always have that feeling when I realize I’m nearing the end of a good book or film. I’m flattered you feel that way about Fat Head. Tough to fill the areas around the ad space, however. I’m sick of this low-fat nonsense! What’s your take on replacing the sugar with artificial sweeteners? I don’t think most of them are as damaging as sugar or high-fructose corn syrup (which is probably worst of all), but I’m cutting back on them anyway. I’ve read that for many people, merely the taste of something sweet produces an insulin spike. A Pavlovian response, if you will. And I know aspartame can create real issues for some people. My mom won’t touch the stuff because it makes her fingers feel numb. I’ve also found that the more I reduce the sources of concentrated sweet flavors in my diet, the sweeter real food tastes to me. Berries now taste fantastic, and even some nuts are starting to taste a bit sweet to me. I think Mother Nature made sweet taste good to us because she wanted us to eat fruit when we found it. But we only found it in season, and it wasn’t genetically engineered to be extra sweet, like it is today. You have some very good points here. I don’t work for Parents magazine but I work for the company that owns them. I think you should write to Parents. They may not be able to respond to each email but they definitely take your opinions and comments into consideration. I suppose it can’t hurt to send a link to the post. The problem is that when it comes to covering health issues, most of the media immediately “round up the usual suspects” — registered dieticians, nutritionists, or MDs, who all preach from the same gospel. Is the cover real or a joke? Photoshop put to good use. Good, so the article about breast milk is a fake? The whole cover is a fake, just making fun of the lousy nutrition advice in the magazine. Good God. Next it’ll be chewable cherry-flavored statins. I’m so glad that I’m not the only one who thinks ODD is a JOKE. It’s the label they slap on strong-willed kids who test the limits because schools don’t want to deal with them (meds, please!. My daughter is 8yo and has been diagnosed with Asperger’s, an anxiety disorder, and severe sensory integration disorder. I have witnessed first-hand the powerful impact that diet has on her behavior. Whole, full-fat foods and vitamin and mineral supplements make a big difference in her–even to the point where we’ve been able to greatly reduce her anxiety medication. The problem is that it’s very difficult to get other people to understand that. The teachers at school give candy as behavior and performance rewards (how backwards is THAT?!?). Other people have the mentality that, “oh, she’s a kid…it’s not going to hurt anything.” But it does, and they don’t get that. It’s very frustrating.